Finally, my person figured it out. I’ve been trying to warn her the last few nights and all she does is tell me to come back in the house. She doesn’t even know what my bark is for. It’s not like I bark up a storm. Just one warning bark when they walk by. And then my person tells me to come in. You see, we’ve been having some visitors the last few nights. And when I’m hanging outside in the evenings I hear them walking by on the other side of my fence. But my person had no idea what my warnings were – until she went out to her car one night and found them there. And the next day she found something else. They’d made their own path right on the side of our house. I’m the only one allowed to make trails in it. I’d better send my person on inspection treks around the house more often. Finally, my person heeded my warning. She checked the front yard and found them out there again. Hey person, you managed to get the light on me in the dark. What was your problem with those javelinas? Chancy and Mumsy, we’ve heard those javelina can be dangerous too, but mostly when my person sees them they either saunter off or just keep chowing down where they are. She won’t let me go near them though. I’m not sure why. I’d chase them off for sure. Fredrieka, fortunately we’ve never run across a mad one, but my person won’t let me go near them. I don’t know why. I’d chase them right out of the yard. Fredrieka, once I saw one on my trails during the day – they mostly come out at night. I tried to chase it, but I ran out of leash and couldn’t go any further. Javelinas! Yikes. Those guys are not fooling around. I’m pretty sure they will eat your face off. Stay in the light, buddy. 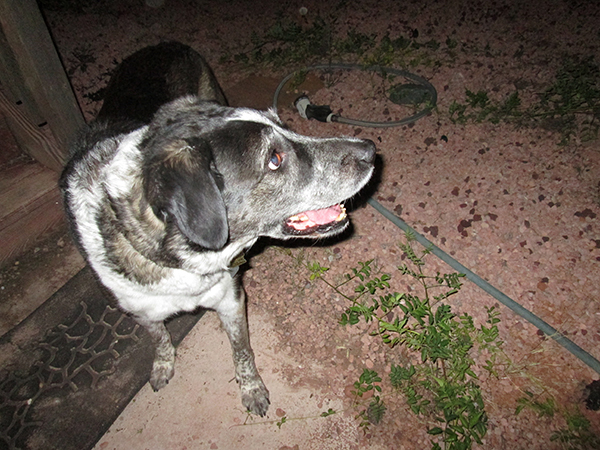 Cupcake, fortunately those javelinas only wanted the juniper berries in the yard and not my face. My person won’t let me near them though. I’m not sure why because I could chase them right out of the yard. Bongo… did you tell your person you were only protecting her from that mean ol’ nasty things? Maybe she just doesn’t understand. /tosses a good boy treat at Bongo. Thank you for keeping us safe young one. Kimberly, my person just doesn’t get it. She makes me stay in the house and she goes out where they are. I was trying to warn her. Thanks for the treat. Yum! Holy pork roast! That is scary. Don’t they bite? Lily & Edward, I haven’t been able to find out because my person won’t let me near them. I’ve heard they can be mean, but if they’re eating they just keep chowing down and otherwise they usually just saunter off. Glad your human has finally caught up with you!! Me too Dalton. It’s really frustrating when I try to tell her something and she doesn’t get it. Luke, I bet those puppies are a lot cuter than the javelinas. I wonder why they were in your front yard….? Were there anything that they could eat? Because from the picture, they seemed to look for something on the ground….didn’t they? Hmmmm…. Kevin, my yard is full of juniper berries that blew off the tree. I think that’s what they were eating. My person says she’s happy they’re eating them because she doesn’t like them in the yard – and it’s better than when they dig up people’s gardens. Probably all the rain and storms you have had at your place have made them come out of there hiding places. Good dog Bongo. 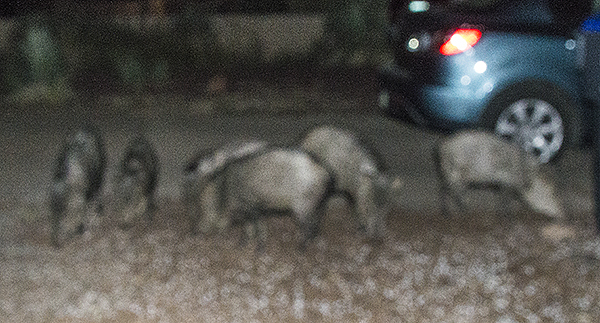 Those javelinas show up all the time now. They even made their own path on the side of our house.